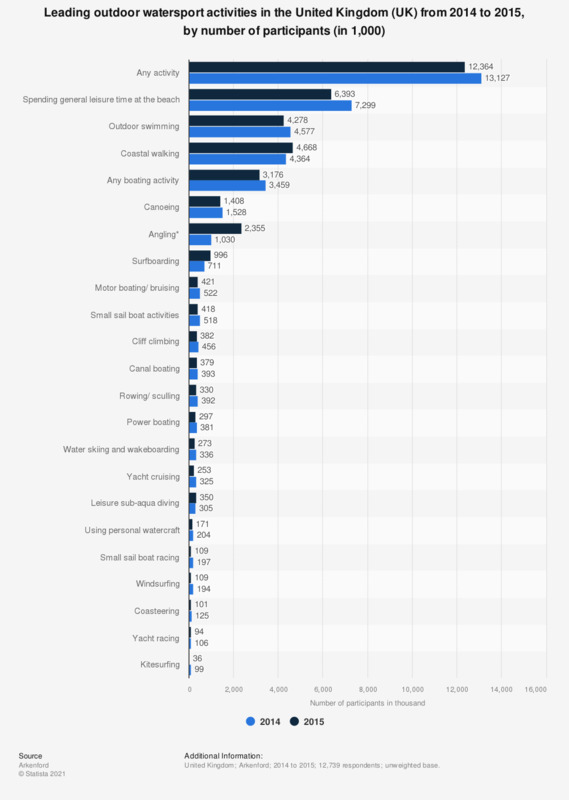 The statistic displays the results of a survey on the leading outdoor watersport activities in the United Kingdom (UK) from 2014 to 2015, by number of participants. In 2015, it was found that approximately 3.2 million people in the UK participated any boating activity. * For 2015, angling was split into the following categories: freshwater angling (335), sea angling (694), sea angling from kayak (72), sea angling from a rental boat (229), sea angling from a charter boat (63), sea angling from rocks (284), sea angling from shore (304) and recreational sea fishing (104). The split for 2014 was unclearified.